How do you measure a signal that keeps changing? Pulse Width Modulation (PWM) makes it possible to dim lights, control the speed of motors, and (with the help of filters) generate analog reference voltages. 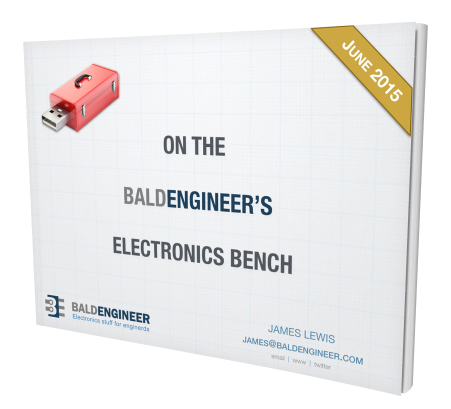 When measuring the voltage or current of a PWM signal, there are unique challenges. You can use this tutorial to measure PWM current with a modified moving average (MMA). As I’ve mentioned in a few posts, I’m working on an RGB LED IoT controller. Soon I’ll post some detailed information on that. In the meantime, one choice I made was to include an INA219 current sensor on the LED power supply. 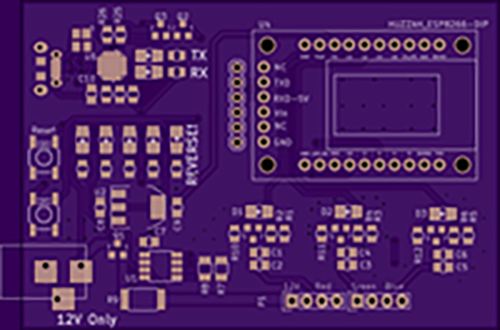 For prototyping, I’m using the Adafruit Breakout Board, but my final design uses the same parts integrated into a custom PCB. When using this current sensor I ran into an unexpected issue. It’s fast, and it’s precise. (Isn’t that a good thing?) The way it works is by measuring the voltage drop across a precision shunt resistor that the load current flows through. Using Ohm’s Law, it comes up with a current measurement. However, it is much faster than I expected and was providing (nearly) instant answers. So each time I checked the sensor, I got a seemingly random value. The problem is the value depended on when I sampled the PWM waveform, like illustrated below. I’d get the “high” current, “low” current (none), or a transition. The “high” current was useful, but none of the other values. Using a simple averaging algorithm I sometimes got stable values, but not by much. Plus, it was taking up hundreds of bytes of RAM just to get an idea of the RMS current used in my design. I needed that so I could more easily calculate power usage. 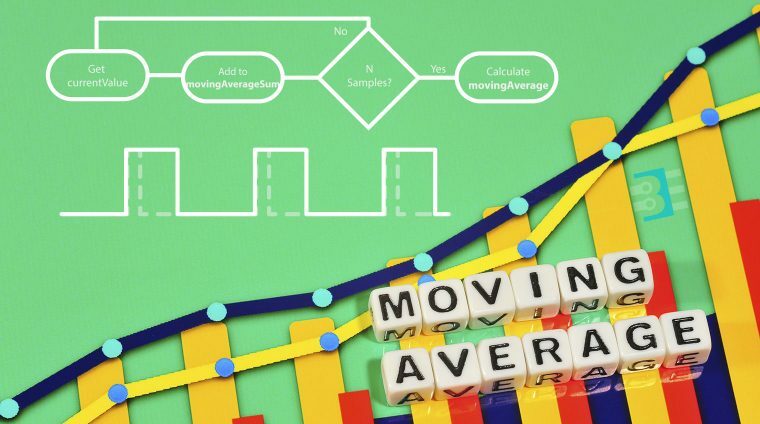 When using MMA, you only need to store three values: “Moving Average Sum,” “Moving Average,” and the number of samples. Obviously, the number of samples can be a constant, saving a byte or two of memory. Instead of collecting N samples and keep a history of samples, or measuring N samples all at once (a horrible idea, btw), the Moving Average Sum is just that. The previous measurements summed together, with a slight twice. The algorithm works like this: Subtract the previous average from the sum. Get a new sample and add that to the sum, replacing the “average” you just removed. Then, recalculate the average. The idea is that since you are removing, effectively, 1 sample and then adding a new sample in, it allows the average to shift in time. This averaging will smooth out fluctuations while providing an accurate average, all while using only 4-6 bytes of RAM. The best part is that if you increase the number of samples used for the sum, neither the RAM nor the calculation time changes. During each iteration of the main loop, my RGB LED IoT controller samples a new value and updates the moving average. Before I moved to the ESP8266, this code took about 56us to execute on an Uno. That speed is fast enough; it has little impact on the program’s performance. I have prepared two Arduino projects to compare a Simple Average to the Modified Moving Average. You can download the Simple Average Example Here and grab the MMA example from both. For the hardware, you can use almost any Arduino. You just need PWM and Analog In pins. (Be careful on ESP8266s, since the maximum Analog In is only 1 volt.) In my test, I used an Uno and inserted a wire from digital pin 5 to analog pin A0. Here is a sample of the output from the MMA. This table illustrates why I like this method. First, it is 20 times faster. Second, it uses less RAM., And I see far fewer fluctuations in the average value. The trade-off, of course, can be that if you are looking for any random or instantaneous glitches, they’ll be smoothed out. However, any averaging algorithm will eliminate them. Whether you are measuring PWM Current or PWM Voltage, using an MMA can give you the average output value. When calculating power, this is helpful because you don’t need to include time in your math. When looking at a voltage, you can get an idea of the effective voltage for a load like a LED or Motor. Question: The only examples I found for this algorithm were financial. What other maths can be helpful in everyday microcontroller projects? You can leave a comment by clicking here. It might be worthwhile to put units on your prints. `currentValue: 1022 mA` and `Moving Average: 595.21 mA` otherwise A great read. Your procedure for measuring PWM current is wrong and insensitive for changing load currents. You could get any MMA number between 0 and max. current depending upon co-incidence of sampling instants and state of PWM output (ie low or high). To prove this, consider that PWM current waveform is repetitive (for constant duty cycle) and your sampling period is fixed. Measurement accuracy now depends upon their co-incidence. Also, your moving average graph is wrong because PWM amplitude is constant (except for capacitive/ inductive loads). 2	divide ‘ summed current’ by 256 to get average DC current which accurately equates to heating effect. Repeat above procedure for each current measurement as required. Measurement accuracy for capacitive/ inductive loads will be good due to symmetry. The Uno can achieve the ADC sampling requirements provided the ADC prescaler is set at 2 or 4 cycles. Accepting decreased accuracy, you can reduce number of samples from 256. Yes, if you know all the details you listed AND your program can guarantee a specified sample rate, then there is a better method to calculate the average current. This example was for when either of those is not the case. In which, a modified moving average is the way to go. I think that will work great for Integers. However, I don’t think it’ll work for float (decimals). A Kalman filter converges faster, especially for a changing signal with noise. avionics workhorse. makes me want to code too & put it across as simply. meanwhile, this’ll help. brace for a few other languages and some noise, while following all the leaves of the page here. Hi James, A good article and very timely for me since I am currently dealing with a noisy signal from an ACS712 current sensor. Maybe the INA219 would be better for me. However i have a couple of suggestions for you to consider. a) it is not necessary to use floating point variables. Using integers would reduce the computation burden on the microcontroller processor. b) if the averaging length “N” is chosen as a power of 2 (eg 4 or 8 etc) the division process becomes a simple shift which is also very easy for the microcontroller processor. Those are the main points, which I expand on below, at the risk of becoming tedious. where MAt is the moving average at time t, MAt-1 is the moving average at time t-1 (ie the previous measurement) and At is the measured result at time t. n is the averaging length. That is, the new moving average is made up of (1/n) of the new value, and (n-1)/n of the previous value. This calculation can be done using integers rather than floating point. The INA219 generates its results for both current and voltage as 16 bit integers (with maximum 12 bit accuracy due to ADC limitations). The calculation can be done with integers without loss of accuracy so long as MAS (MovingAveragSum) is stored as a long integer (32 bits). The code lines are identical to the ones in your photo under “MMA code” in your article, except that in line 2 the variable currentCurrentValue can be int rather than float. Previously movingAverageSum needs to be declared as long rather than float. Column A: rows 2 to 20 all 0, rows 21 to 60 all 1.
column B rows 4 to 60 – propagated by copy from row 3. Then select A2 to B60 and make a chart – a simple line chart seems to work well. You can put a sample of your real world data into column 1 to see what different averaging length values achieve. With an averaging length of 8 and a 0 to 1 step function, the moving average gets to 90% of the new value in row 38 which is after 18 iterations, and to 99% in row 55 which is after 35 iterations. Hi Jim, as a non-engineer I really appreciate your videos – they inform and are just the right speed to retain the interest, thank you! Keep up the quality content!!!! I too recently came across a similar problem with trying to measure the AC amplitude coming out of a current sensor chip for a pic run automation project. The code I used is below. Other useful algorithms for pic/duinos would be efficient RNG. If you have any thoughts on a decent single digit RNG that is uber small in size and does not require large libs, please let me know 🙂 I could really use on for a tiny 10 series pic project. int AN3_AD_IN_110 = 0; // variable to hold value of A/D input from U2 Allegro chip, 110v line. int AN2_AD_IN_220 = 0; // ” from U3 Allegro chip, 220v line. // This signal is baseline of 2.5VDC with a 0-2.5VAC signal riding on top.